(with Joel Segel, foreword by Lawrence Kushner), Jewish Lights, 2012. Some of Reb Zalman’s most accessible, most powerful, most needed teaching has been in the area of prayer. How to make davening real, alive; a connective and life-giving practice? In this latest book of Reb Zalman’s teachings on prayer, he addresses such issues as kavanah, the power of the niggun, davening in the Four Worlds, the “map” of the Prayer service, and how to enhance our experience of synagogue. Tthis is from the same writing collaboration that produced Jewish with Feeling: A Guide to Meaningful Jewish Practice. 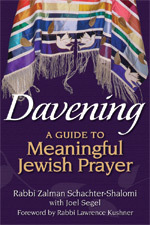 For those of us who enjoyed The Gates of Prayer: Twelve Talks on Davvenology (2011), this latest transmission of Reb Zalman’s wisdom on prayer is a welcome furthering of that teaching, and even if you have never read any of Reb Zalman’s books, this one will surely be a spiritual life-saver!